Why does Titanic still fascinate us? Any Black Passengers On The Titanic? Did Jack Dawson Really Exist? Did You Know: A Lifeboat Drill Was Cancelled? Was the Titanic a British Ship? Wealthiest Man On Board Titanic? What does R.M.S Titanic mean? What Happened To Bruce Ismay? 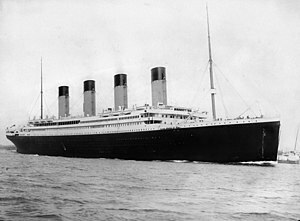 This Sunday, the 15th of April 2012, is the Centennial of the tragic sinking of the RMS Titanic. Of the passengers aboard “the ship of dreams”, more than 1,500 perished, including Gerios Youssef Abi-Saab, my great-grandfather. Gerios, a native of the village of Thoum, in Northern Lebanon, left his wife and six children including Wehbe, my grandfather, who was five years old, hoping to provide a better life for his family by working in America. Lebanon, under Ottoman rule at the time, was struck by famine and poverty and religious tensions pervaded. Lebanese migration became widespread resulting in several waves of departures to faraway lands such as Australia, South America, Canada and the United States. Did you know that there were 154 Lebanese on board the Titanic and that 125 perished? They were third class passengers leaving their Ottoman controlled villages in Mount Lebanon to better their circumstances. They had heard the success stories of returning immigrants from America who told that the “streets were paved in gold” and they were seeking freedom in the New World. Instead, they became prisoners of fate. If you would like to learn more about the Lebanese on the Titanic, click on the maroon-colored link above, which is a pdf of a presentation given on April 17, 2015 at the Vancouver Public Library, hosted by the Lebanese Canadian Society of British Columbia and sponsored by the International Lebanese Titanic Committee and the World Lebanese Cultural Union. The year 2012 was a Titanic year in both the literal and figurative sense. Factually, on April 12 of this year, the world commemorated the 100th year anniversary of the sinking of the famed ship. The unabated fascination with Titanic was buttressed by the release of James Cameron’s epic movie Titanic in 3D on April 4, 2012. There were several ensuing centennial celebrations throughout the world including the event-packed Titanic 100, which I had the privilege of attending in Halifax, Nova Scotia. An iconic museum was inaugurated in the heart of Belfast, on the slipways where RMS Titanic was built. The Southampton Sea City Museum also opened in April 2012 with two permanent exhibits about the Titanic story and the city’s role as a major port from which the ship set sail. When Al-Emir Fares Chehab, age 29, boarded the RMS Titanic in Cherbourg, France on April 10, 1912, he was clinging to his most precious possession nestled in a bottleneck-shaped case, as if for dear life. Inside rested a venerated musical instrument: The Oud. With its distinctive teardrop shape and decorative rosettes adorned with mother of pearl inlay, the Oud also know as Lute, is considered the most important instrument in the Arab world and is dubbed the “Prince of Ecstasy” and the “Sultan of Musical Instruments”. When 38-year-old Shaanineh, my great grandfather’s cousin, boarded the RMS Titanic in Cherbourg on April 10, 1912, the dusk was just settling in and the lights of the great ship were blazing under the fading sun. Was she, a poor immigrant from Lebanon traveling as a third class passenger, awe-stricken at the first sight of the mammoth vessel? Or was she merely relieved after a strenuous journey to have finally reached the famed liner, which would transport her to her final destination in Youngstown, Ohio? Perhaps both. Did A Young Scot Anticipate His Own Demise? Mr. Robert Douglas Norman, a 28 year-old electrical engineer from Glasgow, Scotland, was traveling on the Titanic from Southampton to Vancouver, Canada where his brother resided and where he owned some land. He boarded the doomed ship as a second class passenger. On the evening of April 14th Douglas played the piano at a hymn service presided over by Reverend Ernest Carter. After the collision, Norman met Kate Buss and Marion Wright and told them the ship had struck an iceberg but assured them there was no danger. Jack Thayer was a 17-year-old first class passenger on the RMS Titanic, traveling with his parents on that fateful night of April 15, 1912. He miraculously survived after an epic struggle in the frigid waters. His mother was able to board one of the lifeboats but sadly, his father John Thayer perished. Jack went on to graduate from the University of Pennsylvania four years later. In 1940, he described his harrowing experiences on the famed ship in a self-published book, of which 500 copies were printed for family and friends. Oceanographer Robert Ballard used it to determine the location of the Titanic and proved that the ship had split in half as it sank, contrary to popular belief. Welcome. My name is Josyann Abisaab. You can read stories about my great grandfather who died on the Titanic, learn interesting facts about R.M.S Titanic or click on a link to other related articles. You can find out more about me at josyannabisaab.com.